Attorney Joseph Richardson’s mission is to empower students on college campuses to embrace their legal and ethical duties. Joe’s first experience speaking publicly was at his 6th grade commencement, sparking a lifelong love of sharing his knowledge and helping others achieve personal and professional happiness. Joe provides insight on the intersection between the law and social issues, encouraging campuses to broaden their view of humanitarianism, and ultimately embrace responsible social activism. Using examples from the law and from his life to demonstrate larger principles, Joe inspires audiences to fulfill their duty as groundbreaking citizens in leadership and integrity. Joseph Richardson, Esq. is an accomplished attorney and speaker, regularly contributing his legal insight and commentary to the media. Joe discovered an early passion for law; his plans of becoming a lawyer were confirmed after watching the TV Show “Matlock” in 10th grade. After graduating high school in 1989, Joseph studied Political Science at the University of Redlands where he became a member of Chi Sigma Chi Fraternity and served as president of the Interfraternity Council. While in college, he was voted Student Body President and, as the president, Joseph created Greek Council, which was an organization that advanced self-governance in the Greek community. Among other things, it empowered Greeks to organize and directly fund their own programming for the benefit of the campus community. Drawing influence from his comic idol, late-night talk show host Arsenio Hall, Joe performed his first stand-up comedy routine as a freshman in college. Joe regularly performed comedy on campus, hosted talent shows, and introduced convocation speakers. The L.A. Uprisings erupted during the last days of his presidency, and he used the goodwill gained during his time on campus to facilitate understanding and progress leading to concrete change on campus. In 1992, Joe worked in Congress in Washington, D.C., and authored a column with commentary on current issues for the Redlands Bulldog Weekly newspaper. Joe graduated in 1993 and went to Northwestern Law School. As an alum, Joseph served the University in many ways, including becoming a member of the Alumni Board of Directors, acting as an advisor and patron to Chi Sigma Chi Fraternity, and serves as a member of the Alumni Greek Council and board, formed to advocate for fraternity and sorority men and women on campus. Using his background in law, Joseph Richardson shares recent cases and legal situations involving conduct on college campuses and by college students. By sharing these real-life examples, Joseph explains to fraternity and sorority life members the ramifications of the law for campuses in general, the legal relationship between colleges/universities and chapters and, most importantly, that fraternity and sorority members are not necessarily able to hide behind a university to escape liability in negligent actions. This keynote includes talking about “groupthink” mentality that is often the cause of crimes such as DUI, hazing practices, and sexual assault. Joseph presents how group mentality often leads to the minimization of inappropriate and even illegal activity that makes problems more likely to occur. From a distance, we minimize or “skirting the law” or “towing the line,” like a “sprain,” however, the minimization is what leads to unnecessary risk taking, and it turns out to be a full-blown “fracture.” Sprains, Strains, and Fractures: Greeks and the Law, highlights legal trends as it pertains to college liability issues to give a vision of where the law is going. It is a real “wake-up call” that still manages to be engaging, interesting, and most importantly, empowering. how to identify the “groupthink” mentality that often makes fraternity and sorority life members more likely to minimize questionable activity. Unfortunately, most students have little to no grasp on what their legal duties are, and suffer because of it. On top of this, students often miss that using their own common sense life lessons to tap into ethical duty will allow them to easily fulfill their legal duty. Joe Richardson wants to help students gain a complete understanding of what it is the law expects of them. Joe explains the subtle nuances of the law that often go overlooked and how to stay informed. Joe provides legal expertise with a “reality flavor,” to make legal lessons both informative and interesting. With his help, any student can go above and beyond legal duty and shine as an ethical leader in their community. In this keynote, Joe encourages individuals to recognize legal duty as a benchmark for survival and to discover moral duty as imperative to catapult our campuses, communities, and societies into great and necessary success. In using examples from the law and from his life to demonstrate larger principles, Joe inspires audiences to become groundbreaking citizens in leadership and integrity. This keynote is a great choice for all college students and particularly participants in government, sports, and Fraternity and Sorority Life. what it takes to build ethically responsible campus groups and ultimately, a like-minded campus community. In this keynote, Joseph offers students a fresh perspective on the essence of what it means to be a true leader. He identifies practical considerations that every leader should take into account when working toward their goals and objectives. 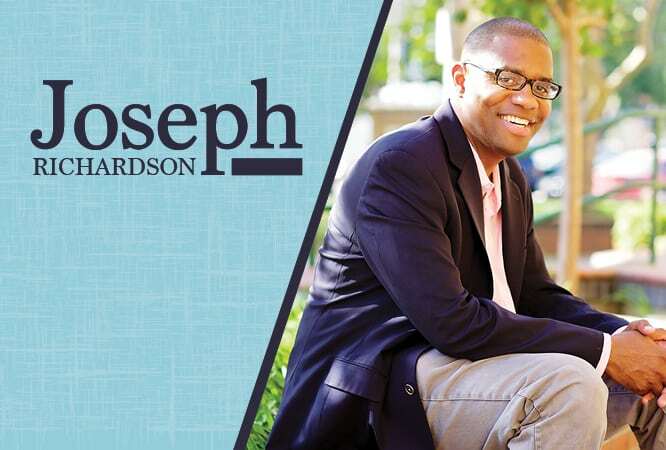 Joseph emphasizes how important it is for leaders to conduct themselves with certain standards regardless of position, designation, or distinction and how they are characterized by their passion for participating and willingness to act. What Leaders Do will help students identify positive leadership traits that will allow them to easily recognize effective leaders and mentors in their communities whom they can emulate and draw insight from, as well as the leadership qualities they need to nurture within themselves. how to set an example by taking responsibility when necessary without resorting to blame or fear. Avoiding hardship in life is impossible. Accepting this truth is one of the telltale signs of real maturity; being an adult means moving forward, turning perceived negatives into actual positives in the process. In this keynote, Joe Richardson shares his personal story of great triumph and tragedy and the priceless lessons he learned along the way. Joe empowers audience members with ideas to help each of them understand who they are, what they have, and the ingredients necessary to move toward what they can truly become. He helps them unleash their full potential and inspires them to keep up the fight. After leaving this program, audience members will have a new appreciation for life and some new, useful tools for mastering positivity. This keynote is a great choice for any community. how to keep anything life brings in its proper perspective. While courtroom dramas may be quite unrealistic in ways, there are some distinct similarities between the courtroom and “real life.” These similarities may not be apparent at first, but upon recognizing them, students will gain a greater understanding of themselves and the larger world. In this keynote, Joe Richardson acts as a guide through this allegory and lends his insight to help frame various parallels within it. Joe uses examples and analogies from the courtroom to teach larger life lessons. He speaks non-judgmentally and engagingly, keeping audience’s attention throughout. Joe’s lessons will help those in campus communities effectively communicate and work together toward common goals. He includes such nuggets of insight as “hearsay doesn’t count,” “a moral compass is mandatory,” and “passion makes for a better result.” This keynote is a great choice for any community. how a thoughtful process in participation and leadership yields results.